The following letter was sent to the editor of Open Journal of Pediatrics (OJPed) regarding the congenital hypothyroidism study by Joseph Mangano, Janette Sherman and Christopher Busby. OJPed's response was, "Thank you for your mails. However, the letter cannot be published. And the paper published in OJPED will not be withdrawn." Critique of the related study by Mangano and Sherman, by Steve Wing, was published here. A letter to the editor regarding the same related study by Alfred Körblein, published here, was also rejected by OJPed. The letter was the subject of this post by Jeffrey Beall who keeps track of predatory journals. Also, the video by Ian Goddard clearly explains issues regarding this study as well as　another study by two of the authors. In the article, “Changes in confirmed plus borderline cases of congenital hypothyroidism in California as a function of environmental fallout from the Fukushima nuclear meltdown,” Mangano, et al. base their conclusion on erroneous and selective data interpretation regarding the number of confirmed congenital hypothyroidism (CH) cases in the study population. The authors obtained the newborn screening data for congenital hypothyroidism (CH) from the Genetic Disease Screening Program at the California Department of Public Health (CDPH), including the number of confirmed cases and children screened, grouped by their thyroid stimulating hormone (TSH) levels from 2009 to 2012. The CDPH office was contacted to obtain a copy of the original data used by the authors in an attempt to replicate their findings. In California, the cutoff for a preliminary indication of CH is a TSH value >=29 mIU/L, as seen in the Newborn Screening cutoff/reference ranges dated 09/11/2013. Authors make several errors in the study, beginning with the passage above. First, the only thing being measured by the Newborn Screening program is an elevated whole-blood TSH level which is not a diagnosis of CH as further clinical confirmation is required for a diagnosis of CH. TSH values over the cutoff of 29 μIU/ml only means “positive” screening, and it is not true that any child meeting this criterion is prescribed replacement hormone. 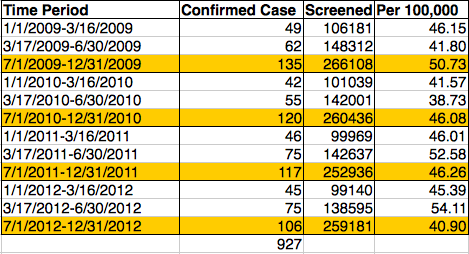 Thus, the definition used by the authors of “confirmed CH cases” is inaccurate, yet the authors use "positive" screening to erroneously count confirmed cases. Third, the authors further define “borderline cases” as “a cautious range of 19.0 - 28.9 μIU/ml,” and add the "borderline cases" to their estimate of total CH cases. But this definition is meaningless, as CH cases are only confirmed after follow-up clinical observation and further testing. While the authors declare that California has "a consistent definition of the disorder," conjuring the ill-defined "borderline" category to be combined with mere "positive" screening cases represents an egregious introduction of bias. This step appears to increase the 2011-2012 CH total from 658 to 4670, inflating the p value (p < 0.00000001 for “combined confirmed and borderline cases”) in the statistical analysis. In their Discussion the authors then write "...despite having to define borderline cases arbitrarily. In California, adding borderline cases (TSH between 19.0 and 28.9 μIU/ml) to those confirmed cases (TSH over 29.0) increases the number of cases by more than seven fold." This statement confirms how data selection was biased and that the authors consider "borderline" and "positive" screening to be equal to "confirmed cases" of CH. Currier also provided the same two sets of data that were given to the authors (see Tables 1 and 2) and additional details about the CH screening program. Alfred Körblein, a retired physicist and independent consultant in epidemiology in Germany, plotted the number of “confirmed” cases of congenital hypothyroidism per 100,000 (Figure 1). As can be seen, an increase in the confirmed cases in the period from March 17th to December 31st shows variation similar to other time periods. Fourth, the authors state, at the end of the Results section, “With much larger samples than just confirmed cases, a better understanding of the true change can be approached.” The desire for larger sample size by the authors of this paper suggests a limited understanding of the CH screening program in California. In conclusion, the study by Mangano, Sherman and Busby has critical flaws: 1) incorrectly taking raw positive screenings (TSH >=29 μIU/ml) to be confirmed CH cases, thus disregarding the correct number of actually confirmed CH cases they received from the CDPH; 2) defining a meaningless diagnostic category of “borderline” cases that has no basis in the screening program or in medical practice; and 3) claiming that the faux rate they conjured (positive screening results plus "borderline" screening results) is a valid construct; and 4) claiming that the CH increase in 2011 was statistically significant, whereas the plotting of the number of actual clinically confirmed cases from 2009 to 2012 clearly shows no significant increase. ✴Copying or re-posting part or whole of this post is not permitted. Please link to this post instead. Paragraph 5 in "4. Geographic distribution" in section "Official stance on radiation effects." "...a clear regional difference of thyroid cancer occurrence (per million) in the second round results: 49.2, 25.7, 19.6 and 15.5 in the evacuation zone, Hamadori, Nakadori, and Aizu, respectively." was corrected (correction shown in red) to "...a clear regional difference of thyroid cancer occurrence (per 100,000) in the second round results: 49.2, 25.7, 19.6 and 15.5 in the evacuation zone, Nakadori, Hamadori, and Aizu, respectively." Note: Corrections were made in the following paragraphs in pink color on October 17, 2017. Second paragraph in section "Screening protocol"
First paragraph in section "Thyroid cancer cases"
Below are the results of radiation testing on canned salmon produced by an American seafood company, Vital Choice Wild Seafood and Organics. (Here is the Japanese article). Becquerel (Bq) is a unit of radioactivity: 1 Bq means "one disintegration event per second." Mako Oshidori in Düsseldorf "The Hidden Truth about Fukushima"
On March 8th, 2014, comedienne/journalist Mako Oshidori gave a lecture, "The Hidden Truth About Fukushima" in Düsseldorf, Germany, organized by a citizen's group, SAYONARA Genpatsu Düsseldorf. Translation of Mako Oshidori's March 6th, 2014 press conference at the German IPPNW (International Physicians for the Prevention of Nuclear War) Symposium in Frankfurt can be found here. The lecture, given in Japanese with German interpretation, was transcribed and translated into English. Moderator: Good evening everyone. My name is Mariko. Welcome to a lecture by Mako Oshidori. As we all know, the Japanese people experienced the Great East Japan earthquake and tsunami on March 11, 2011. A huge earthquake, followed by tsunami and the nuclear accident, has become an unprecedented disaster for the Japanese as well as the rest of the world. Moreover, this accident is not only out of control but continues to be in critical state.